John P. is the host of GeekBeat.TV and is a former telecom executive and CMO for a datacenter and hosting company Layered Technologies. I’ve found no one better at explaining the nuances of hosting than John. We’re going to give you a behind the scenes look at how hosts operate and think. Scott Ellis: Today’s guest is my good friend, Mr. John P. Most of you know John as the host of GeekBeat.TV, a show that I also take part in and occasionally host, but John is also a former telecom executive and was the CMO of Layered Technologies, which is a host and data center provider here in the Dallas area. John has a knack for explaining the topic of hosting in a way that makes it interesting and easy to understand. The importance behind this episode is that hosting is something that many of us get wrong. You’d think it’s an easy decision: I go out, and I find a plan, and I put my website on it. I don’t have to worry about it, right? They do all the backups. Well, there’s a whole lot of other things that come into play with hosting that can have very serious implications for your business if you’re doing any kind of business online or aspire to. Some of the things that John is going to share with us today may get you to rethink your approach to hosting. If you happen to be a technologist, and maybe you do something like I do, building websites for a lot of clients, you probably have the hosting discussion pretty often. It’s not always easy to walk your customers through the things that they need to know. This episode is going to arm you. If nothing else, you can just send them this episode and let them hear about it from a true expert. Let’s get in and see what John has to say about hosting. I’m here with Mr. John P. How do you say your last name? John Pozadzides: Even Greek people refuse to say my last name. Scott Ellis: We’re going to talk a little bit about website hosting today. 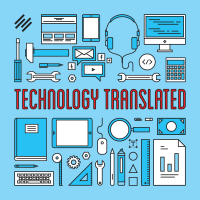 This is the Technology Translated podcast, so our entire goal is to put this into terms that anybody can understand. This is a technical podcast for non-techies. John Pozadzides: Wait a minute, you want me to explain web hosting to people who don’t understand web hosting? Scott Ellis: That’s exactly what I’m asking you to do, and I don’t know anybody that does it better, because I’ve heard you talk about this stuff before. John Pozadzides: That is a sad state of affairs. Scott Ellis: You’ve done a good job of making it easy to understand, so we’ll put you to the test again today. John Pozadzides: We shall endeavor to do our best. Scott Ellis: Do not let me down. Scott Ellis: You do a lot of things. You’re probably most well-known now as the host of GeekBeat.TV, out of retirement. Scott Ellis: A very short retirement. I hope it was fun. But you were, once upon a time, also the Chief Marketing Officer for Layered Technologies. John Pozadzides: I was indeed, and also before that, I spent a better part of a decade doing all manner of infrastructure-related stuff for companies like GTE and SAVVIS Communications, so I do have quite an extensive background when it comes to things like data centers and Internet connectivity, security systems, et cetera. Basically, all the underpinnings — the things that make the Internet actually work — I grew up with that stuff. Scott Ellis: You’ve known that stuff for a long time, and you have a knack for explaining it in very easy-to-understand terms. John Pozadzides: That’s just because I can’t understand it myself, so I make smart people tell me, and then I just regurgitate. Scott Ellis: There you go. Well, get ready to throw up all over the microphone. First of all, let’s go into talking about the different types of hosting, because there are multiple different types of hosting that people can choose from. The price points are all over the place. If I don’t know what to do here, I don’t even understand my options. John Pozadzides: Let’s just start off by saying, hosting — there’s really just one kind of hosting in the universe, but you can get different sizes of it. Wherever you host your website, you’re basically putting a bunch of HTML pages on a server that’s connected to the Internet. How big of a server you get, how old of a server you get, that’s going to determine how responsive the site will be, how fast it will be, and your costs. It’s just like having a desktop computer. My grandmother might have an old 286 laying around that barely functions. Scott Ellis: Does she still use that? John Pozadzides: I don’t know. Some people have a Commodore 64. That’s okay. And then some people go out and buy the latest, greatest thing, and obviously the newer stuff is going to work faster and better with less waiting than the older stuff. The question is, what’s the difference between, let’s say, a free or almost free website hosted at GoDaddy or HostGator or one of these guys versus a big server farm that Google uses? Really, the difference is that instead of getting an entire computer dedicated to yourself, you’re just getting a little timeshare on one. You’re getting a little tiny piece of one. We categorize different types of hosting as shared hosting, meaning that instead of having a server all to yourself, you’re going to share it with other people. Then, you could get virtual servers, which means that you could take one physical computer, and you can run virtual machines on it. Those are like a fake computer running inside a real computer, but it allows you to have multiple instances of an operating system on one computer. Scott Ellis: It’s like having your own computer, but there’s a bunch of them on the same hardware. John Pozadzides: That’s right. Because if you think about it, if you are just using your computer at home and you’re surfing the web or manipulating some images or things like that, most of what you’re doing is sitting there reading the screen, and the computer’s waiting for you to give it input. It’s got a lot of spare cycles. So if you could find a way to let multiple people run across the same hardware platform, then everybody uses the CPU and the RAM at different times and the hard drive at different times, so they’re sharing it. That’s the way virtual machines tend to work. Then you could get your own dedicated server, so now you’ve got a box all to yourself. No one else can touch it. And then, beyond that, you would scale into a situation where you have multiple servers, so you would employ additional technology — for example, a load balancer. A load balancer would allow you to take two or three different servers, and using a box that sits in front of those servers, you send the request to that box, and then it round-robins or distributes the load between multiple servers. John Pozadzides: As you can imagine from the things that I’ve just described, every step up is more costly. What people don’t know is if we go back to our shared server situation, these things may cost $2 or $3 a month for hosting your website. That sounds really attractive. Scott Ellis: That’s pretty cheap. John Pozadzides: I mean, I’d like to host GeekBeat for $2 or $3 a month. That would be nice. John Pozadzides: The problem is that when you get into one of those very low-cost hosting situations, you actually have not tens of other people on the server, not even hundreds, but usually thousands. It’s not uncommon to see, let’s say, 2,000 websites hosted on a single server. Scott Ellis: That’s getting crowded in there. John Pozadzides: Yeah, but if you think about it, you want to be that web host. It may cost you a couple hundred dollars a month to run that server, but if you’re collecting 2,000 times $2 or $3 a month, that is a high-margin business to be in. Scott Ellis: It’s a very high-margin business to be in. And most of those websites are probably not getting that much traffic, right? John Pozadzides: That’s the thing. If we have a website that gets five or 10 page views a day, and it’s on a server with 2,000 others, what are they getting — 20,000, 30,000 page views a day? That’s nothing for a server to handle. That’s really not much. A well-optimized server can handle a million or more page views a day, so they really load them up. But what happens is, when you have your site hosted on a machine with 2,000 other sites at any given time, it only takes one of those sites having a really popular article of some sort to bring a killer amount of traffic and crush that server and take down 2,000 websites, essentially. If you’re going to host something on a $2, $3, $5 a month shared hosting plan, just make sure that it’s not anything critical. If you want to put your family’s personal website that only you and your relatives look at on one of those cheap ones, go for it. It’s a great place for that. But if you want to put a business on there, don’t plan on being in business very long. Scott Ellis: I will say that, from the standpoint of working with a number of clients who have web hosting on a variety of types of servers, that usually we see in those shared instances that sites do not perform as well. That does have some downstream impacts, as well, because Google can see how your site performs. Now, granted, we don’t really get to see behind the curtain of Google’s algorithm, but what we’ve been told is that site performance is definitely a factor in SEO. John Pozadzides: It is, absolutely. Not only do you care about placing business accounts on servers that are going to be reliable and stay up so people can visit your website, but the faster your page loads, the better it performs in search results. Google has been very, very clear about that, and that’s a principle that’s been going on essentially since the beginning of time. And there’s a very practical reason for it. If you think about it, if you’re Google, and you send someone to a website and they can’t even load the page — let’s say that you’re on a little shared web server and you write a really good article and 10,000 people want to read it all at once — Google knows that that shared web server will go down. It cannot handle that traffic. So they’ll start sending traffic to it, but as they see people bouncing back to Google, they’ll figure out that the site’s not up, and they just stop sending traffic. The faster the site responds, the more Google trusts that site’s ability to handle essentially any amount of traffic you send to it. We all want to have a ton of visitors come to our website, right? It’s like, “Oh, it will make me feel really good if I write an article and 100,000 people read it. It feels good, warm, and fuzzy.” You probably didn’t make any money off of it. Who cares? You feel good. But you don’t think about the fact that you have to have underlying infrastructure to support that number of visitors. It’s like saying, “I’m going to build a bar out in the middle of the woods, and I’d really like to have 300 people come drink at my bar, but there’s just a muddy dirt road getting to it.” You can’t get 300 cars down the road, okay? You can have a dream, but if you’re going to have that dream, you’ve got to put the infrastructure in place to support it. Scott Ellis: The other concern I have with shared hosting is — and we’ve actually seen this happen in a couple of instances — if a site becomes infected with malware. Depending on how that server is configured, it can become easier for other sites on that same server to also become infected, and it can run away very quickly. I’m speaking directly from experience of having to clean up some sites where that was exactly what happened. John Pozadzides: Yeah, unfortunately, no matter how good the host is — there’s a lot of very reputable hosts that handle shared hosting — 1and1.com and Bluehost and DreamHost, there’s a lot of them. But the problem is that there are always people discovering new vulnerabilities within the underlying software architecture that the server itself runs on. If one flaw is found in the OS, one security hole, then it doesn’t take much before somebody hops on that server and does actually do damage to thousands of sites, all at once. And they do it because it’s fun. They do it because it’s a challenge. One way of protecting yourself from that is to step up from the shared hosting space into a virtual machine of some sort. You can actually do searches for ‘virtual server hosting,’ and now you’ll see a different set of price points. But usually, these price points will start in about the $20 range. One of the cool things about virtual machines is that generally, they actually run on equipment that’s higher-end, so they’ll put up a much bigger, meatier server, and they’ll run these virtual machines on it. You have the ability to start off with a certain level of hosting, and then as you need more power, you can go into the website and turn up the juice. If you need more RAM or need more CPU, you go into a control panel, and you say, “Give me some more.” Then it takes five minutes to reconfigure, and you don’t have to move to another host. You just get more power with the existing host by running a virtual machine. Also, you have your own dedicated operating system instance, so if there was some kind of vulnerability, then they would have to attack your virtual machine specifically, which is a lot less likely. A single site sitting on a virtual machine is not going to be generally as big a target as going after a machine that has thousands of sites on it, unless your site is big and popular. GeekBeat, it doesn’t matter where we put it. It’s going to be a target, so we have to stay on top of the security aspect. That actually brings up one other factor here, which is, are you actually capable of running this thing yourself? Do you know how to configure the actual underlying operating system, and are you able to harden it and protect it? Are you keeping up with all these things? Most people are not, and I can’t do it. Scott Ellis: Nope, me likewise. John Pozadzides: Really, then, you have to start considering a managed hosting infrastructure, where you place the responsibility on someone else for keeping up with updating your operating system and making sure that they’re doing security audits and you don’t have holes. For businesses, this is, I believe, the only way to go. If you’re very small, if you’re a one-man shop and you’re just getting started, that’s a different story. But once you get to a point where you have a sustainable business and you need to have a professional web presence, you need to have it being managed and monitored by somebody. Do we want to talk about who’s doing ours? Scott Ellis: Yeah, we definitely want to talk about who’s doing ours. That would be Synthesis from Copyblogger. All of our stuff resides with them. VSELLIS.com actually lives on the Rainmaker Platform. We’ll come to that in a little bit. But the situation you just described is what Synthesis does, but they are specialized in WordPress-only sites. They won’t host anything else. John Pozadzides: Yeah, what I like about them is that if there’s ever an issue, we just open a trouble ticket, and they take care of it. You think about it: what’s your time worth? Our site’s gone down once or twice, and it’s because of stupid things we do to it, not that they do to it. Scott Ellis: John ‘fixed’ it again. John Pozadzides: Yeah, but it doesn’t matter. Even if I ‘fix’ the website and take it down, I just put in a trouble ticket, and I say, “Hey, guys. Sorry, the site’s down. Can you fix it?” A few minutes later, it’s back up. Actually, there’s tremendous peace of mind with that. If you think about what your time is worth, the additional cost of having them run and manage that, maybe it’s $50 a month or $100 a month more than we would have to pay anyway just for the infrastructure required for our site. You’re not wasting that money. They’re keeping it up. You’re getting exactly what you paid for. Scott Ellis: I would guarantee anybody that thinks it’s a waste of money, all you need is for your site to go down one time, and you don’t have anybody to call, and you have no idea how to fix it. You’ll pay 10 times that much just to make the pain go away. John Pozadzides: It’s easy to pay $1,000 or $2,000 for emergency website repair, easy. John Pozadzides: We talked about shared hosting. We talked about some virtual machine-type hosting, and then the next thing is when you step it up and you need an even bigger infrastructure. You go with a dedicated server. At this point, the sky’s the limit. You could buy a server starting at $80 a month, maybe. This is going to be an older server, not very high-powered, and truly, I do not recommend those. Here’s why: a little known fact people don’t realize about the hosting industry — I happened to notice because I was in it — most of those servers that you pay under $100 a month for, they are old servers sitting in a data center. They are old servers that have been sitting there for years and years and years, and they’re just charging $100 month for them because those servers were paid off long ago. Why do you care? A server’s a server, right? Except for one very important detail, which is that usually, those old servers also have old hard drives in them to match. That means a four- or five-year-old hard drive sitting in a cheap server in a data center, with your website on it, is going to give up the ghost eventually. When it does, I hope you have backups, and I hope you know exactly what you’re doing to get it back up. Scott Ellis: We wouldn’t have ever experienced something like this firsthand, would we? Even kind of recently? John Pozadzides: We are talking from experience. There is no doubt about it. Generally speaking, if you’re going to go looking for a dedicated server host, one of the things that I would highly recommend you do is make sure that the server you’re getting placed on is relatively new. One of the other things that you can do is, if you option up to an SSD drive in the server, it’s going to do two things. First of all, most hosts have only recently begun putting SSD drives in, so you know it’s going to be fairly new. And secondly, it’s also going to speed up your machine a lot, which is going to go a long way toward, again, helping with your Google performance metrics and higher search ranking for the content you’re hosting on that machine. Scott Ellis: What do you think somebody would expect to pay for a dedicated server that isn’t the old dusty box in the corner that’s just waiting to die? John Pozadzides: Probably $200 to $250 a month will get you started with a pretty decent server. You could run a lot of websites on it. You could do a lot of other stuff with it, if you’re so inclined. Even a couple hundred dollars a month, you should be fairly safe, but you always need to have backups going on, always, always, always. Just keep that in mind. You may want to invest in some other stuff like an Amazon account, where you back up your machine to the Amazon cloud, things like that. Speaking of performance, and not to get off of our hosting topic, but on a related note, one of the things that we do in order to speed up the performance of our websites, is we use distributed caching of our media files, and we use Amazon to host our media files. There are WordPress plugins that you can drop into a website that will mirror every media file you upload on to Amazon’s cloud and then essentially change the code in your webpage so that the webpages load from your server, but the images and media files load from Amazon’s cloud. Doing so speeds up your website dramatically, because it takes a lot of load off your server. Amazon has much more bandwidth than your one server does, and they can distribute those files all around the world. Scott Ellis: They don’t have more than the Geek house, do they? John Pozadzides: No they don’t. We’ve got a lot of bandwidth here. That’s a little side note, but I would highly, highly encourage everyone, no matter how small your website is, to set up an Amazon account and use one of these plugins to mirror your content. By the way, they only charge you based on usage. Even for us, I think our total charges on Amazon, they average around $100 a month and that’s for all the media files we cache between OneMansBlog.com and GeekBeat.TV, and we’re talking about well over 1 million page views a month. A hundred dollars a month for all that. If you’ve got less, you could literally be paying pennies per month. Scott Ellis: A side benefit of that is that you get this built-in backup already happening because now, all your files, they’re going to live on your WordPress server, but they’re also going to get sent out and mapped to the Amazon server. So if your website suddenly disappears, I think it’s the whole WP content, or at least the uploads under that, is going to get mirrored up there. You can go get access to that again very easily. John Pozadzides: The media files and things like that definitely get mirrored, and then what you can do is you can run a different little plugin that will back up your database and your theme files and things like that, so you would have the entire thing backed up to Amazon. Like I say, it’s very, very cheap relative to the amount of benefit you get, which is another reason that Google rewards people for using CDNs, content distribution networks, and other types of caching. They know it doesn’t cost much. It’s just an extra step and the sites that take that step get rewarded with additional traffic. In essence, it pays for itself. Scott Ellis: It does, because you will definitely get more traffic. I have seen this repeatedly with my websites. Every time I have moved it to a better server, upgraded the caching, started using a CDN, even if I did nothing else different, I would almost always see a little bump in traffic, directly from Google Search. John Pozadzides: Every time we’ve ever improved our web hosting, we’ve seen traffic increases, anywhere from 20 to 50 percent every single time. Scott Ellis: That’s not insignificant. John Pozadzides: No, it’s a noticeable bump as soon as you get to a faster host. Like I was saying before, Google knows when you have crappy hosting that they can’t send you much traffic, or they will not only hurt you, they’ll hurt everybody else you’re hosted on the server with. Believe me, they know when you’re on a shared server, because they see the IPs. They see the IP address that your domain is hosted on, and they see 2,000 other websites hosted on the exact same IP address. In fact, there are tools out there — you have to do a search for it, I don’t remember one right off the top of my head — that will look up that will tell you how many sites are hosted on one server, and you’ll be shocked. Scott Ellis: You probably don’t want to look that up because it might depress you. Scott Ellis: If I was in the real estate business, I would look at opening data centers because the revenue per square foot has got to be through the roof. John Pozadzides: It is. It is. You just have to have the people that can support it. That’s a big deal, but you can make good money on data centers, no doubt. John Pozadzides: The last little step that we glazed over earlier was, if you grow beyond a single server, then what you can do is you can do a few different things. You can set up multiple servers, and you can do this in two different ways. Another way that you can do it is you can do it based on the load of the existing server. Let’s say you send a visitor to server number one, and that visitor’s doing something really, really intensive, and it puts a lot of load on that server. Then you send really light visitors to servers two and three, and those two are finished really quickly, but server one is still busy. Then it could essentially see that server one is busy and go back to number two or three. That’s a more sophisticated type of load balancing, but you can do that as well. Then, if you really want to do some better load balancing, in my opinion, what you do is you begin using multiple data centers. So we might put a server in Washington, DC, and put a server in San Francisco. Then we can use something like a distributed DNS type of load balancing, where you find a DNS provider. Scott Ellis: Anybody you’ll recommend on that? John Pozadzides: We use Amazon Route 53 for ours, but they don’t do this particular thing that I’m describing. It’s something I hope they get into, but there are a number — I don’t recommend any of them, because I just don’t have any experience with the others — but there are some very reputable ones that will do this. What you do is you put one in, let’s say, London, one in Tokyo, one in DC, and one in San Francisco, and it’s going to do geographically based load distribution. The DNS looks at where the request is coming from. By the way, I didn’t really clarify what I mean by ‘DNS’ earlier. Every website is hosted on the server, and that server has an IP address. That IP address is like the phone number of that server, and DNS is like the phone book. If you know somebody’s name but you don’t know their phone number, that’s the same thing as knowing someone’s website URL but you don’t know the IP address. If you want to go to GeekBeat.TV, that technically doesn’t exist in the digital world. But an IP address associated with GeekBeat.TV does exist. And maybe let’s pretend — we’re right in between DC and San Francisco, but let’s say it was San Francisco — then it sends us to San Francisco. But someone in New York, it sends their traffic to DC. And someone in Europe, it sends them to London. And someone in Australia, it sends them to Japan. It looks at where people are and sends them to the closest server. In that case, if you have servers and data centers all over the world with DNS routing to the closest server, then what you’d do is you just set up a little script that allows you to upload your content to one server, and it automatically replicates to all the other servers. Scott Ellis: Very good. It helps distribute all the traffic to wherever is the most appropriate, both geographically and based on that server’s ability to respond. Scott Ellis: Good stuff. I’m guessing this kind of big infrastructure though, distributed CDN, DNS, there are a few more TLAs in there — this is a little bit more expensive, though. We’re really stepping up now into something that’s fairly sophisticated and is going to cost them some bucks, right? John Pozadzides: That’s the thing. Generally speaking, yes. However, lately with the emergence of, for example, these distributed DNS service providers, you actually could do something fairly inexpensive. In fact, we have done that with GeekBeat. Instead of setting up dedicated servers all over the world and doing the distribution between them, you can actually employ the technique of setting up virtual machines in multiple locations and then load balancing between those. You might be able to get a virtual machine for $30, $40 a month. Even though there may not be a huge amount of traffic, let’s say, in Europe, if you put a virtual machine hosted in a European data center and you do it very cheaply and then you mirror your content onto it and you use distributed DNS to send European visitors to that one, the difference in their page load time means instead of European visitors having to cross the Atlantic to get their data from somewhere in the United States — that will take hundreds of milliseconds of round trip time for each request — but by putting it over in the European data center, you can probably lower that to tens of milliseconds. It doesn’t sound like a big deal, but 500 milliseconds is half of one second, and for every single request to be delayed by half of one second, Google will penalize you for that. You may be getting US traffic just fine because the performance is fine here, but in Europe, Google’s penalizing you. You’re not getting European traffic because the roundtrip times are too long. People’s abandon rate is higher because they don’t want to wait for pages to load and it feels sluggish. You put a $20, $30 a month website over there on a virtual machine in Europe, and you use the distributed DNS to send European people to it, and that’s really not that expensive for a big performance gain, a potentially big SEO improvement and lots of other benefits. Scott Ellis: That’s substantial, and I had no idea we had a European office. John Pozadzides: We’re working on it. Scott Ellis: I’ve got to go visit. It sounds like fun. Scott Ellis: I would agree, for some very good reasons, but John, this is your show. John Pozadzides: We’ve been down this path the last 15 or 20 years. I guess I’ve been doing stuff online now for something like 17 years, longer than most. We’ve been down this path in every format possible. There are a number of problems with hosting your own web server, but not the least of which is when your web server goes down and you need to be contacting people and doing things like opening trouble tickets and stuff, they tend to want to send you an email. You have email notifications going on, but when your server that’s down is hosting your mail, you lose that primary method of communication. That alone is enough reason to just end this conversation. But there are other problems with hosting your own server, and one of them has to do with spam and the way spam is handled — not only the way it’s handled on your server, but your server has to talk to all the other mail servers everywhere. One of the challenges we’ve had, actually — and we’ve dealt with it in different ways — but with the Geek Beat domain fairly being popular, we get a lot of spam here. We were doing some things where, for example, some of our folks who had email boxes wanted to forward the mail to their Gmail account so that they could just check everything from one common box. That’s a very common thing to do. I recommend it. It’s great, with one exception. When your mail server is doing its thing and working just fine but you are getting a lot of spam and you are forwarding your spam from your mail server to Gmail, guess what? Google starts thinking that your mail server is a spammer. This is not good, and that will cause problems. In that case, one of the techniques you can employ — and this is what we’re currently doing, and I guess this is probably about the best thing that I can recommend to anybody at the moment for this sort of situation. If you want to forward your email to a Gmail or any other primary email provider out there that you have a free account, what you do is you go into your domain name registrar — in our case, we’re using GoDaddy — and you use GoDaddy’s free email hosting to set up redirects for your email boxes with their mail servers. We’re hosting our own website. We’re hosting it at Synthesis, and it’s hosted across a distributed network of servers, but the email actually stops at GoDaddy’s mail servers, where if you send an email to John@GeekBeat.TV, their mail server forwards it to Google’s Gmail servers. Here’s why it’s important. Even though they’re forwarding the exact same mail that our little mail server was forwarding, Google knows that GoDaddy’s mail server is not a spammy server. Scott Ellis: They’ve got a relationship and an understanding, and they’ve validated each other. Scott Ellis: They’ve done the dance. John Pozadzides: They don’t care about Mail.GeekBeat.TV, but they know that GoDaddy is not spamming them, and so they’re not going to shut it off. This flood of forwarded messages coming to John@GeekBeat.TV to my Gmail account doesn’t get marked as spam, doesn’t penalize our domain, et cetera. If your site goes down, your mail server still works. GoDaddy’s mail servers are a lot less likely to go down than our server. Scott Ellis: I also host all of my business email on Google Apps, which is also an option. John Pozadzides: Absolutely. If you don’t mind paying $5 a box for that, then you actually get a lot of benefits from going with Google’s hosted options. Scott Ellis: Yeah, there’s a lot of benefits with it. You get, obviously, all the other applications that come with it, the calendar and a whole bunch of other things. John Pozadzides: More storage, everything else too, right? Scott Ellis: For the reasons that we talked about before, truthfully, even as technical of guys as you and I are, we’re not going to go manage our own mail server. One, who wants to do it? Two, that is a whole different level of geekiness that I just can’t even approach. John Pozadzides: It’s just something that requires full-time people on it. It’s not worth it. Even if your website itself is not that critical to you because it’s your personal family website or something, I guarantee you that when your mom’s email stops working, you’re going to hear … it’s not worth it. Just don’t mess with it. Use your domain registrar to do that. Scott Ellis: Keep it simple. John Pozadzides: Keep it easy. Scott Ellis: All right. Hopefully, that has clarified the myths around hosting and the things that people probably don’t understand that will help them make a better decision in choosing a web host for their site. John Pozadzides: Hopefully we didn’t just confuse everybody even more. That’s a lot of info. Scott Ellis: It was a lot of info, but it was very nicely laid out. Well done, Mr. P.
For the rest of you, if you have any other questions, if we glossed over something that didn’t quite make sense or you need more clarity or you just want to ask us a question that we didn’t get to on the show, by all means feel free to drop us a line. You can reach me @vsellis on Twitter. I am +Scott Ellis on Google+, VS Ellis on Facebook. Where are they going to find you online, John? Are you actually online? John Pozadzides: I try and stay off as much as possible, but you can always Tweet me @johnpoz. On Google+, I’m just John P., and John@GeekBeat.TV gets the email right to me. John Pozadzides: Thanks to GoDaddy. Scott Ellis: Thanks to GoDaddy, and go check out GeekBeat TV at GeekBeat.TV. John Pozadzides: That usually gets you there. Scott Ellis: That will get you there. All right, guys. Thank you very much. Technology Translated is brought to you by the Rainmaker Platform, the complete website solution for content marketers and online entrepreneurs. Find out more, and take a free 14-day test drive at Rainmaker.FM/Platform.